Foreign Affairs Minister Chrystia Freeland returns to Washington this week to continue negotiations with her counterpart, United States Trade Representative Robert Lighthizer, in an effort to conclude negotiations to revamp the North American Free Trade Agreement. 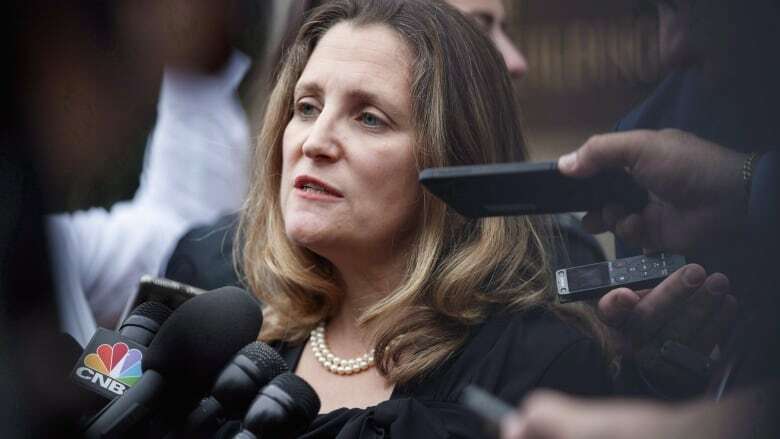 Foreign Affairs Minister Chrystia Freeland says she's returning to Washington this week to continue negotiations with her counterpart, United States Trade Representative Robert Lighthizer, in an effort to conclude negotiations to revamp the North American Free Trade Agreement. "I've been in touch today with Ambassador Lighthizer and his team and we agreed that we would continue to talk in Washington later this week — the specifics of our calendar we haven't quite worked out — but we will be meeting in Washington later this week," Freeland told reporters in Ottawa Monday. Freeland said her negotiators were in the U.S. capital Thursday and Friday continuing their work at a technical level; they are now back in Washington, where they will continue to negotiate throughout the week. Freeland said Canada is in a continuous state of negotiation with U.S. officials and that it was "absolutely the right thing for us to meet this week." The negotiations are still looking for a breakthrough on contentious issues, such as protection for Canada's cultural industries and the retention of a dispute resolution mechanism used to challenge punitive anti-dumping and countervailing duty measures. Canada has used the mechanism in the past to challenge American duties on softwood lumber. Lighthizer has long opposed this chapter of NAFTA as a violation of U.S. sovereignty. The U.S. also is trying to extract some concessions from Canada on the dairy front, demanding more access to a market that is largely protected from imports by supply management. Prime Minister Justin Trudeau has said repeatedly that he will not dismantle the country's farm policies. Speaking to Paul Wells of Maclean's magazine later Monday, Trudeau said that his government was continuing to push for a good deal and would not be pushed into signing a bad deal. "Every time we get momentum, every time we work together, we do knock off a few more things and move closer to an eventual decision point. We're not there yet," Trudeau said. "There were points in the spring where we thought we were perhaps days or weeks away. Turned out not to be the case. We might be days or weeks away now. It might not be." News of Freeland's resumption of talks in Washington came as MPs returned to the House of Commons and opposition parties took shots at the Liberals over their management of the economy and the ongoing NAFTA negotiations. Conservative House leader Candice Bergen said her party would not have lectured the U.S. on gender rights and the environment in the midst of trade talks — a jab at the Liberal government's decision to make such topics part of its negotiating strategy. Bergen said Trudeau has managed to "tick off" a lot of key people during the trade negotiations, which started 13 months ago at the behest of U.S. President Donald Trump, who is under a congressional and political deadline. Canada and the U.S. need to present an agreed-upon text to the U.S. Congress by Oct. 1 in order to join the deal the Trump administration has signed with Mexico. Trump has threatened to move ahead on that agreement without Canada — a course of action Congress could thwart weeks ahead of November midterm elections that will test the strength of his Republican party. NDP Leader Jagmeet Singh urged the Liberals not to cede any part of Canada's dairy supply management system to the American side, and to ensure a renewed deal makes life better for Canadian workers. He suggested neither will be an easy task in negotiations with Trump. An early order of business for the Liberals this fall is passing legislation to enact a trade deal with Pacific Rim countries — the Comprehensive and Progressive Agreement for Trans Pacific Partnership — designed to open up new markets for exports beyond the U.S.